The blobfish is found only in very deep waters around mainland Australia as well as Tasmania, it is a fish that you would not normally see because of the deaths that it lives at. 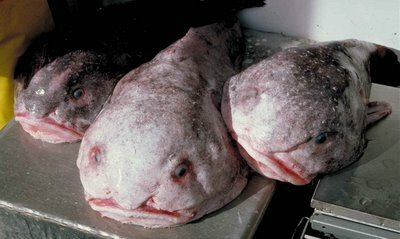 They are usually caught in nets that are bottom trawling and the blobfish accidently get caught. There are scientists that believe the blobfish is a threatened species because of the bottom trawling, but there really is no way of telling, the Australian Museum does not think they are endangered. “Mr. Blobby” has a facebook page which was started by the Austrlian Museum if anyone is interested. Also there is a great video from the Australian Museum that goes for just over 3 minutes, explaining how Mr. Blobby was caught, and how the blobfish changes once it is out of the water. The blobfish in the first photo above is the fish out of water for a period of time, when they are in the water they look totally different. This is the best video I could find on the blobfish, most as you can imagine have been made into comedies. This entry was posted in Australia, Fish and tagged Blobfish. Bookmark the permalink. I visit your blog to be educated on a new subject everyday 🙂 Knew about this one, but wasn’t aware of all the facts. Thanks Mags. You have to admit he is ugly when he has been out of the water for awhile. I didn’t read the post about the Pygmy Hippo, because I didn’t want to get sad. This Blob fish though… wow. What a face! Thank you for – once again – educating me, Mags. Your posts are great! Whoa, is he funny looking! Dang that’s one freaky face! nose too! haha! They are perfectly named, aren’t they? Funny little faces, too. Thanks for sharing this, I’m sure I never would have stumble upon the blobfish on my own. Is this life imitating a cartoon? What a curious creature — I love him. Thanks, Mags. This was a special treat. The blobfish in the first photo is not a happy little chappy at all, then again who would be being taken away from their home :-). No he does not look happy, unreal how much they expand when taken out of the deep water. This is amazing! I’ve never seen or heard of a blobfish before. What a sight to see. Love learning about new animals. I hadn’t heard of this one. Cheers to another unique creature from OZ that I didn’t know. Meanwhile, now that is one ugly fish! Thanks Mags. 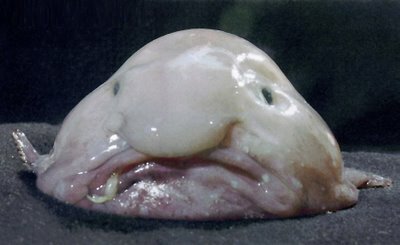 In a couple of those photos the blobfish reminded me of the cartoon character Ziggy. Quick; hide this post. Those of you who have read my blog and know about our Koi pond will understand that my husband will want a blobfish if he sees this. I’m surprised it wasn’t thrown back. That is one ugly fish. what an interesting ugly creature. I love it’s name – blobfish. I feel bad for the blobfish. And I think they’re kind of cute, in a “so ugly they’re cute” sort of way. Ugly cute is a good description, it is very strange how much they change in shape when they are out of the water. Blobfish is the perfect name for this one! What an unusual creature! It sure doesn’t look too happy…. as .. somebody already said .. a face that only a mother can love. That has to be the most hideous looking creature I have ever seen!!! Interesting to learn about though! Blobfish – it does look like a blob. I’ve seen that facial expression on some people from time to time. Wondering what it is like to have no muscles and to have to eat whatever happens to swim by! Most appropriately named fish ever. What a funny looking creature. I don’t think I could eat it just served to me whole like that. The face is kind of creepy. It almost doesn’t seem real. Quite freaky looking. I thinkjit would be safe to say there are no blobfish beauty queens out there. Haha. Love Mr. Blobfish! Enjoy your break. I just spent last week showing my brother and niece around our part of Florida. Have fun! What a strangely unusual & unusually strange fish. I’ve never heard of them before, Great informative video. I have never heard about the blobfish. Maybe that is to no surprise taken they live at depths around 600 to 1,200 meters. Not the sweetest thing in the world – and I can imagine that comedies is a place that would exploit the fact. I take it, it’s not much for eating either without muscles? Thanks for a great post. I agree a very strange looking creature, just amazing what is in our seas, no doubt more strange animals will be discovered as we are able to go deeper into the depths. Sorry for the late reply, I haven’t been on my blog for ages, my Dad had a triple by-pass operation he is 81 so it has been a very emotional roller coaster. All is well and he is recovering really well I think considering his age. How amazing – all my decades an Australian & I’d never heard of these fish! I’m glad you enjoyed the post. Whoever named these fish certainly chose the right name. 🙂 It is amazing the many different marine life that are around, and I’m sure there are some that are still not yet discovered. Sorry about the late reply. I haven’t been to my blog for ages, my Dad had to have a triple by-pass operation, he is 81 so it has been a very worrying time. Thank goodness he seems to be doing well, I am looking after him until he gets back on his feet.